Skarmory are tall birds with long necks and long legs. They have red feathers under sheaths that cover their very sharp wings. Their skin and feathers are hard because they live and are raised in very harsh conditions. Their nests are usually found in thorn bushes, where continual scratching of their skin will eventually harden it into an iron-like state. Skarmory, like most Steel-type Pokémon, are silver-gray except for their red feathers, yellow eyes, and metallic-blue neck, talons, and tail. Their feet both have three toes on them, two in front and one in back, and their tail has hooked ends. Skarmory also possesses a pointed, triangular crest on its head, and, although Skarmory are otherwise birdlike, several teeth in its lower jaw. Their wings are actually hollow, despite their appearance, allowing them to travel up to 190mph. No other Pokémon has the same type combination as Skarmory. 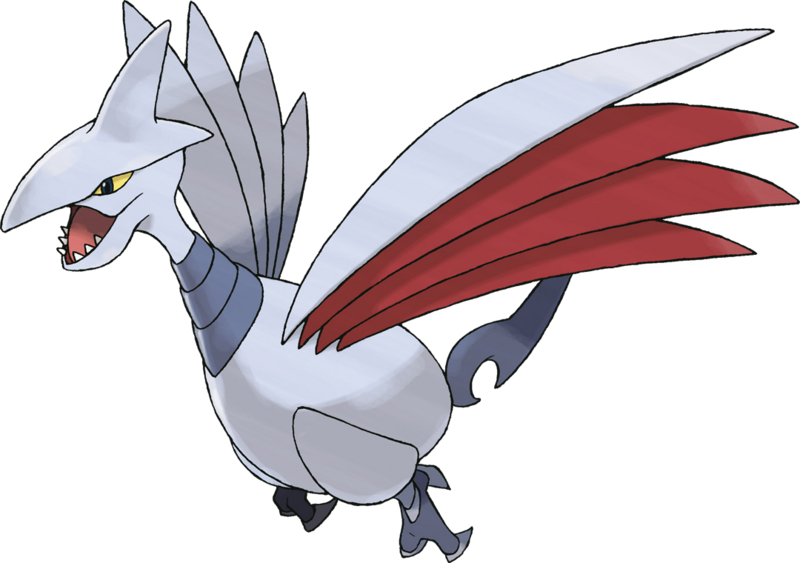 Skarmory is the only Pokémon to learn Steel Wing via level-up, and is one of only three Pokémon that get STAB from it. The other two are Scizor and Empoleon. Skarmory has the highest base Defense of all Flying-types.